Red brick dust got it's beginning and associated power in an abandoned brick yard on Dumaine Street in New Orleans. This was common place for Voodou Queens to gather and hold ritual. Repeated police raids on the brickyard drove the practitioners to Bayou St.John and Lake Pontchartrain. It has been used by hoodoos for centuries to scrub their front steps in order to ward off curses, evil, and bad juju. Adding the dust to chamber lye (urine), ammonia, or vinegar is called "reddening" and used along with blueing, produces a very powerful effect with cleansing and protecting a home. I sell two bluing items here as well. To lay red brick dust around your home will keep those who wish to steal, or do any other harm from crossing, onto your property. Allegedly, evil can not step over the line of dust. On Mondays, Wednesdays, and Fridays, get up before dawn without speaking to anyone and wash your doorstep with your own urine and water. When it dries, sprinkle this dust across the doorstep. To make the wash stronger, write the Name of the Captain of Police on paper, burn the Name-Paper to ashes, and add the ashes to your scrub water. 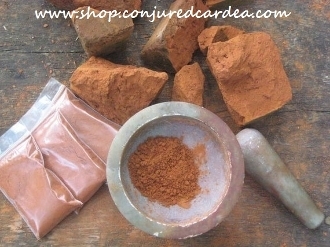 For a money drawing dust, mix red rick powder with cinnamon powder and brown sugar with water (to make a "reddening")and scrub your doorstep inward for quick and continuous cash flow. You will receive a 2x3 inch zip bag.